This specialty oil refining MLP has a strong and consistent history of growth -- both in sales and distributions -- but due to industry cyclicality, it's trading at a deep discount. One reason investors like the energy sector is high yields. Some of the highest yields come from master limited partnerships (MLPs), which pay out the vast majority of their profits to unitholders in the form of distributions. Investors usually must choose between MLPs with high yields and slow distribution growth or lower yields but faster growth. Occasionally the market presents a chance to purchase an MLP that offers both. Calumet Specialty Products Partners (NASDAQ:CLMT) is a specialty refiner of petroleum products. 70% of gross profits come from sales of its 3,500+ portfolio of specialty industrial products such as waxes, fracking solvents and high performance automotive oils. The remaining 30% of gross profits come from traditional fuels such as gas, diesel, jet fuel, and asphalt. Oil refining is a cyclical, low-margin industry. As seen below, Calumet and its larger competitors like Phillips 66 (NYSE:PSX), Valero Energy (NYSE:VLO), Marathon Petroleum (NYSE:MPC), and HollyFrontier (NYSE:HFC) are facing margin pressure. This is for two main reasons. The first reason is rising input costs. West Texas Intermediate (WTI) oil has been trading at a discount because the oil is priced in Oklahoma (where most oil from the Texas fracking boom goes). The last few years Texas has seen increases in oil production of 30% annually. 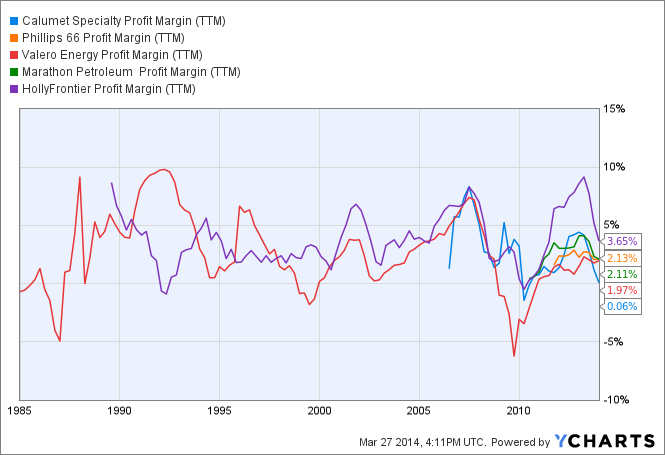 This cheap oil resulted in high margins -- as much as $34/barrel in the third quarter of 2013. Traders are speculating that increased pipeline construction will shrink the oil glut in Oklahoma, causing WTI prices to rise. Margins fell to $16/barrel in the third quarter of 2013. The second reason margins have declined is the increase in cost of renewable energy credits (RINs). The EPA changed its ethanol mixing requirements in 2013 and caused a spike in RINs from $0.02/credit in 2012 up to $1.18/credit in 2013. Calumet saw its 2013 RIN expenses soar to $90 million. The EPA has recently decreased its requirements and RIN costs have fallen to $0.5/credit.While increased RIN expenses and compressed margins caused declines throughout the industry, Calumet faced one additional hurdle. The partnership had to perform regular maintenance at three of its refineries in 2013. Maintenance is performed every four years, and it resulted in decreased output from the facilities in addition to maintenance expenses. The recent downturn in the refinery industry caused by the above factors has resulted in a temporary decrease in distributable cash flow (dcf). Distributions are paid out of dcf. Calumet's dcf declined by 93% from 2012 to 2013, which panicked the market (likely pricing in a distribution cut). This fails to account for four catalysts that secure the distribution and make future growth likely. The first catalyst is the WTI/Brent spread has hit a low of $0.86/barrel in September and has since recovered to $6.54. Analysts are predicting the spread will stabilize at $11.5/barrel through 2015.Management has seen a 25% improvement in margins during the first half of Q1. The second catalyst is that Calumet has five investment projects underway. These will cost $500-$550 million and generate $190-$215 million in Adjusted EBITDA by the end of 2016. Management has an excellent record of growing through acquisitions (the third catalyst). The partnership has purchased refineries in key areas close to cheap oil sources (Texas, Montana, and Wisconsin). Calumet also buys makers of other specialty products such as Royal Purple and then feeds into its supply chain to grow sales. Bel-Ray: maker of 1,000+ specialty products sold in over 100 countries. United Petroleum: maker of Quantum brand of lubricants, sells 160 products through 50 distributors in 35 states. Anchor Drilling: Leading provider of fracking fluid. The final catalyst protecting Calumet's distribution is the $593 million in liquidity the partnership started the year with. Recently the partnership sold $900 million in 6.5% senior notes due in 2021. $235 million will pay for the Anchor Drilling acquisition and $500 million to refinance debt. This leaves $165 million for other expenses.Also, Calumet recently filed paperwork for a $300 million equity offering. With over $1 billion in liquidity (after the upcoming secondary offering) Calumet represents an amazing opportunity. The size of the offering will result in 20% dilution that will likely drop the unit price 15%-20%. This will give long-term investors the chance to lock in a secure 13%-13.5% yield. Calumet is a partnership whose management has a proven track record of accretive acquisitions and wise investments. The refining industry's recent downturn has caused a knee-jerk reaction due to fear of a distribution cut that is unlikely. Management has secured sufficient liquidity to continue paying the current distribution, invest in growth, and continue making acquisitions. The combination of improving industry margins, future acquisitions, and organic investments will ensure the long-term security and growth of distributions. As Calumet's margins recover and distribution grows the unit price should experience strong capital gains on top of generous distributions.